The Penshurst Botanic Gardens is a 13 acres reserve located in the centre of the township of Penshurst. The reserve incorporates several different facilities and recreational areas. In the center of the reserve there are a number of built structures, including a 25 metre concrete public swimming pool, a bowling green and associated clubrooms, a cream brick public toilet, three disused tennis courts with a brick tennis pavilion. Some ten metres from the western boundary, there is a natural spring, which has been beautified, in recent years. Colloquially known as the "never-fail spring", it is said to be one of the main reasons that Penshurst was sited in its current location. The reserve has three distinct botanical collections. The most recent is the ' botanic wetlands' area, which is towards the north of the site. The area consists of a number of artificial lakes, streams, waterfalls and a weir, in and around which a wide variety of trees, shrubs, rushes, grasses and sedges which are specific to wetlands around the world have been planted. Located to the north west of the gardens, several beds of native and indigenous plants have been laid out along side an artificial stream which travels from the never fail spring to the botanic wetlands area. Within this planting, several memorial trees have been planted, dedicated to the early pioneer settlers of the Penshurst area. The oldest part of the gardens, other than the natural spring is the collection of European trees located to the east of the gardens. The majority of the these trees appear to be English Oak (Quercus robur), Algerian Oak (Quercus caneriensis) and a number of hybrids between the English Oak and the Algerian Oak. There are also specimens of Arizona Cypress (Cupressus arizonica), Himalayan Cedar (Cedrus deodara), Sycamore (Acer pseudo- platanus), Peppercorn (Shinus molle), White Poplar (Populus alba), Golden Willow (Salix alba) and weeping Willow (Salix babylonica). It is thought that these largely deciduous trees were planted in the 1920s to replace an earlier collection of pines. The Penshurst Botanic Gardens is of historica, scientific and social significance to the township of Penshurst and the Southern Grampians Shire. The Penshurst Botanic Gardens are of historical significance for their association with the very early Mount Rouse Protectorate, which was established adjacent to the never fail spring in the early 1840s. It is of further historical significance as it shows the changing development and focus of the townspeople over 150 years of recreation. The Botanical collection which is included in the 1995 wetlands development is of scientific significance for its range of wetland species from around the world. This forms an interesting focus for the gardens, which prior to its re-development was in decline. The gardens are an important cultural site for the people of Penshurst, used for active and passive recreation, social events and relaxation. The collection of Oaks is in fair condition, the buildings within the reserve are also in fair condition, the newer landscaped area is in excellent condition. 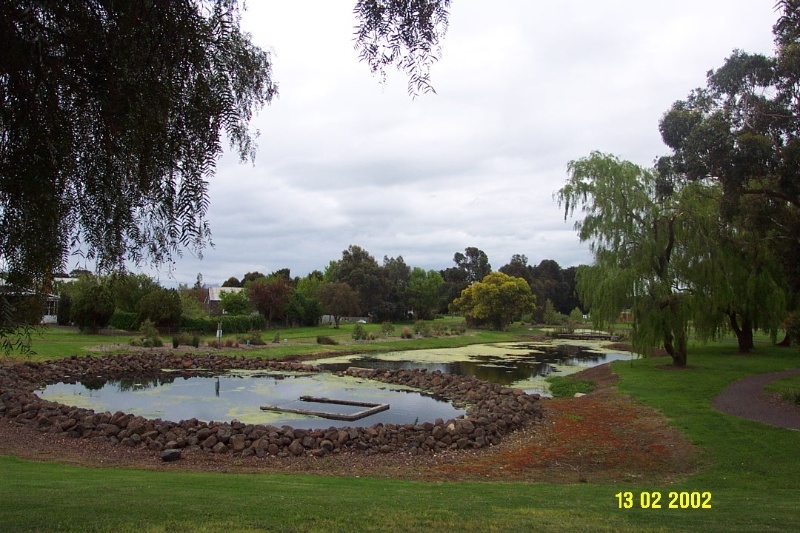 The Penshurst Botanic Gardens is located in the centre of the township of Penshurst. It is a large reserve of approximately 13 acres bounded by Chesswass, French, Cox and Martin Street. The reserve incorporates several different facilities and recreational areas. In the center of the reserve there are a number of built structures, including a 25 metre concrete public swimming pool, a bowling green and associated clubrooms, a cream brick public toilet, three disused tennis courts with a brick tennis pavilion. Some ten metres from the western boundary, there is a natural spring, which has been beautified, in recent years. Colloquially known as the "never-fail spring", it is said to be one of the main reasons that Penshurst was sited in its current location. The spring has been surrounded with loose bluestone boulders, creating a circular pool above the spring. The spring has an overflow of three concrete slabs that have been arranged to form a waterfall which the overflow cascades over into pondage, which has been constructed to form a lagoon, and artificial creek, which runs through the gardens. A small brick pump house, dating from the 1920s stands to the immediate north of the 'never fail' spring. The reserve has three distinct botanical collections. The most recent is the ' botanic wetlands' area, which is towards the north of the site. The area consists of a number of artificial lakes, streams, waterfalls and a weir, in and around which a wide variety of trees, shrubs, rushes, grasses and sedges which are specific to wetlands around the world have been planted. Some of the more important plantings in this area include 23 semi-mature American Swamp Cypress (Taxodium distichum) which have been partly submerged within the artificial lake; Pin Oak (Quercus palustrus), Western Red Cedar (Thuja plicata), Himalayan Spruce (Picea smithiana), Red Maple (Acer rubra), American Spruce (Picea mariana), White swamp oak (Quercus bicolour) and tupelo (Nyssa sylvatica). The area was developed and opened in 1995. 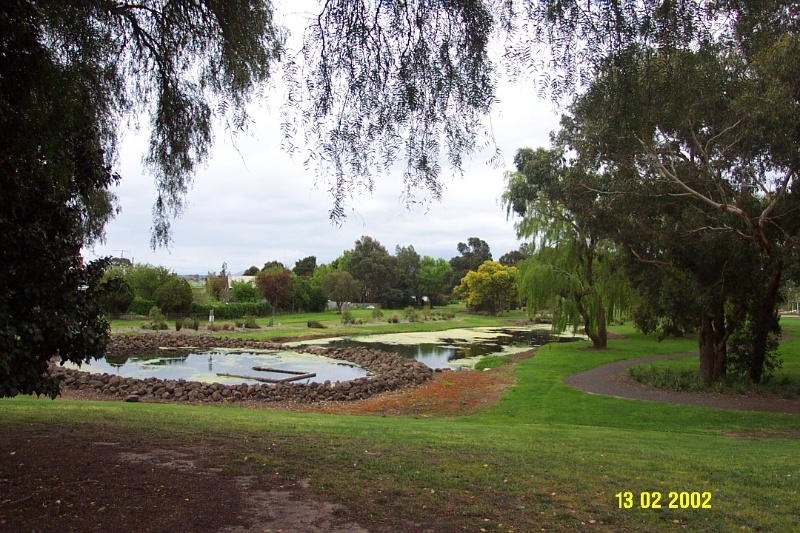 Located to the north west of the gardens, several beds of native and indigenous plants have been laid out along side an artificial stream which travels from the never fail spring to the botanic wetlands area. Within this planting, several memorial trees have been planted, dedicated to the early pioneer settlers of the Penshurst area. These trees were planted in 1995. Three Ornamental Pear (Pyrus sp.) trees have been planted as memorials to the Whitehead family. Each tree has a simple bronze memorial plaque set in volcanic stone located at the base of each tree. The Whitehead family memorials are as follows: Whitehead/ James 1864-1953 / Mary 1888 - 1969 / A tribute to our parents; Whitehead / to the memory of / John 1915-1995 / James 1913-1945/ Service to Australia / 1939-1945. A Linden Tree (Tilius grandiflora) is located nearby, dedicated by the Albert Family descendants. The memorial plaque is of simple bronze mounted on local volcanic stone. It reads: In grateful memory of / Andreas and Agnetta Albert / migrated from Saxony, Germany/ to South Australia in 1848. / From there they travelled to settle / in Gnadenthal - Penshurst in 1852. / This memorial linden tree was planted / by the Albert family descendants in 1994. The oldest part of the gardens, other than the natural spring is the collection of European trees located to the east of the gardens. The majority of the these trees appear to be English Oak (Quercus robur), Algerian Oak (Quercus caneriensis) and a number of hybrids between the English Oak and the Algerian Oak. There are also specimens of Arizona Cypress (Cupressus arizonica), Himalayan Cedar (Cedrus deodara), Sycamore (Acer pseudo- platanus), Peppercorn (Shinus molle), White Poplar (Populus alba), Golden Willow (Salix alba) and weeping Willow (Salix babylonica). It is thought that these largely deciduous trees were planted in the 1920s to replace an earlier collection of pines. The gardens have a relatively low degree of integrity, since the later 19th century plantings have been removed and a range of mid 20th C recreational facilities have been introduced.